PASCO, Wash. -- All the puzzle pieces of what it takes to make a TiLite wheelchair now are housed in the same place -- the company's new Pasco plant. That's a change that Iain Bampton, a TiLite process engineer, said has helped streamline the process of creating their wheelchairs. At the company's former location in four separate buildings at the Port of Kennewick's Oak Street Industrial Park, Bampton said there was a yo-yo effect: A new wheelchair bounced back and forth from building to building while being assembled. Now that TiLite has moved to the former Food Pavilion on West Court Street, Bampton said there is flow. "It's much easier to track chairs going through the system," he said. The 13-year-old company invested about $7 million to transform the inside of the former 70,000-square-foot grocery store into its wheelchair manufacturing plant. On one day last week, some of TiLite's 140 employees were welding special frames into a customized chair. At another end of the production area, workers were testing finished wheelchairs by rolling them along a raised platform before sending them for a final inspection. 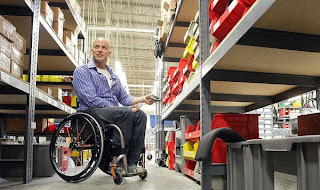 The path of a wheelchair is easy to follow, from customer service to design to the production floor, where each chair starts as an order form and ends up a fully built wheelchair, with every option the customer requested. Options range from small wheels that light up to push handles that let someone else power the manual wheelchair. Then the wheelchair is shipped to the customer it was built for, like Richland High School junior Chelsea McClammer. Chelsea, 17, has been in a wheelchair since age 6, when she was hurt in a car accident. Her TiLite chair is lightweight compared to ones she used as a child. "We called it the tank, it was so heavy," Chelsea said. Now she uses a TiLite wheelchair to compete in wheelchair basketball. It's designed differently than her everyday chair and allows her to spin better, she said. The wheelchair looks sleek, and she got a rock 'n' roll pattern tattooed on the frame. TiLite marketing manager Todd VanderHoogt (pictured), who uses a wheelchair himself, said the entire process of creating wheelchairs like Chelsea's has gotten more efficient since the company moved in December. Their volume is up by almost 25 percent since the move. On some days, up to 50 wheelchairs can be finished, VanderHoogt said. Folding wheelchairs can take about five days to assemble, while custom-fitted rigid wheelchairs take about 10 days, he said. TiLite CEO David Lippes and a group of investors started the company in 1997 after buying the sports division of Finley-based Sandvik Metals. The company, formerly called TiSport, now makes only manual wheelchairs. TiLite is continuing to work on expanding its international sales, VanderHoogt said. Its wheelchairs already are sold in 35 countries. TiLite competes against two large medical supply companies -- Invacare and Sunrise Medical -- for the wheelchair market. VanderHoogt said part of the company's success is finding a niche by providing higher-quality custom chairs, ranging in cost from $3,000 to $6,000. And the frames of the chairs have a lifetime warranty, although people tend to change chairs every five years or as insurance allows, he said. TiLite's returning customers tend to order a new chair to get the latest design and innovation. He said the company has shaken up the wheelchair market, driving the other companies to come out with new options as well. TiLite is preparing to launch a new version of its own -- a youth wheelchair completely designed for a smaller body, rather than taking an adult wheelchair design and shrinking it, VanderHoogt said. The company also recently added two new adjustable adult models made of aluminum. On average, a wheelchair user will push the wheels 3,000 to 5,000 times per day, VanderHoogt said. And an active wheelchair user will push more. That's just something human shoulders weren't meant to do every day. That's why the company focuses on saving weight wherever it can, he said, partly by offering chairs that are small and compact and appear to mold to the user's body. At Spokane's Inland Medical & Rehab, Don Whitney, the chief operations officer, said TiLite's wheelchairs are the most popular ultralight wheelchairs with his customers. Whitney said his customers know they are getting a high quality chair that will be customized for them and their needs. And they appreciate having one that is made in the United States from a company that goes the extra mile and supports wheelchair sports, he said. The chairs fit like a baseball glove and hold up well for the people who are active in sports, such as basketball, Whitney said. "They really are No. 1 in the field," he said.